The art of creating papier mache figures or sculptures can be simple if we consider the materials used but the final work can be as difficult as your imagination and skills permit. Many of us at a given moment of our childhood have had the opportunity to shape small figures by pasting glued strips of paper on a balloon, a cardboard model or an armature of some sort. The final result was not always artistically worthy but it surely proved to be fun. 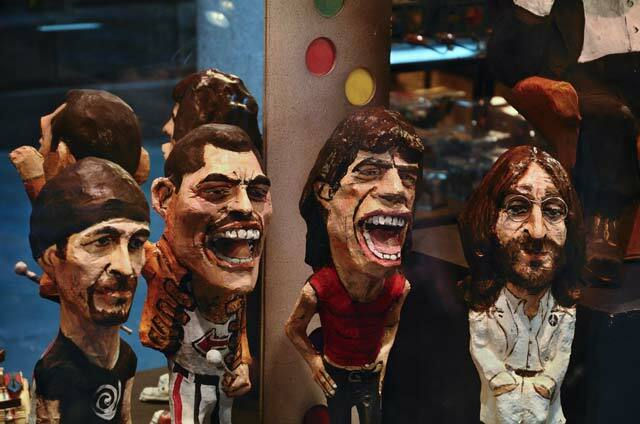 For those of you who always wished to make a wonderful artwork in paper mache and never could, here is another good sample of exquisite papier-mâché reproductions of famous artists like John Lennon, Mick Jagger, Freddy Mercury...(the other guy looks like the Edge from U2 but I am not sure). There is this store near Plaza Sant Jaume in Barcelona where it is possible to buy such art among other articles. It is not cheap but you would impress your friends at home for sure and of course it is the heck of a present if you can afford it. I can definitely understand why you wouldn't want to give them any publicity. I hate when people act like you are stealing something when you are just taking photos. You are a better person than they at the shop, Carlos! I hope they see this post. The art is charming. And I would not mind at all having some of these!